In the UK they are turning coal mines into SOLAR FARMS ! Of the three sites, the Welbeck Colliery, which was owned by UK Coal and closed in 2011, will be the first to come online. The 32 acre, 11.2 megawatt (MW) solar farm will encompass 44,160 solar panels mounted on approximately 15 kilometres of frames. The energy generated is predicted to power more than 3,450 homes in the local area and lead to carbon savings of around 5.11 tonnes each year. The land that the solar farms are on is waste land. Finding a use for the land that is productive and clean is wonderful! “These sites are based in the Midlands and north of England, which is important as we believe it is essential that solar developments are made across the UK and not just in the south west,” said Adrian Pike, ceo of Anesco. Spreading solar farms around the country keeps losses from transmission down. The further you have to transmit energy the more loss of energy you have. Here in Vermont we have several small solar farms. This one is only five miles from my home. This one is built on a landfill. Another is in Rutland where my son lives. The largest in Vermont is one that tracks the sun. The panels stay in position facing the sun all day. Moving slowly for the most efficient use. There are too many for me to post links. Vermont is a leader in solar use. Many of us have solar on our roofs or in my case in my back yard. In most cases people use net metering. That is when you are making more electricity than you use your meter spins backwards, giving you a credit. When your array is not making as much electricity as you are using the meter spins forward. My array has been making electricity for me since August, 2008 and I have not paid a cent for my electricity since October, 2008. I have built up credit for the extra power that my array has put into the grid of hundreds of dollars. Vermont is leading the way here in the USA. We have a goal of 90% renewable energy by 2050. See link below. Lets talk about renewable energy especially solar. Solar works even up North here in Vermont. The further South you go the better solar will work. This is a wonderful idea. If only the politicians and oligarchs in the U.S.A. were so forward-thinking. JJ, many of the progressives are forward thinking. Too bad we have deniers who are obstructing all progress. Nirek, Berkely, CA had a fantastic project several years ago (which they had to stop due to the recession). I think it could work in nearly any community. Any house that was built within the Berkeley city limits automatically was built with solar panels. The cost was embedded in the mortgage, so the homeowner could simply pay off the costs over 15-30 years. Funk, that is a good idea. I like ideas that work. Great topic, and something we all should be investing in IMO. I have been a proud user of solar panels to save on electricity and to help with environmental issues since 2011. I am on a list to add panels to my roof, I am scheduled for the fall of this year. Can’t wait. I am not to the point of feeding electricity back into the system, but will be after the new work is completed. Even with the limited amount of panels I have right now my electric bill is so low, the cost is more or less insignificant. I Can’t wait to begin receiving credits so that I can convince others that the initial expense is well worth it. Many people who could be enjoying this clean energy source are prohibited from doing so because of the initial cost. Here in Ohio there is no tax credit for this improvement to your home. Monica, here in Vermont there is a credit on taxes for solar. So I saved about 8 grand off the initial cost just to do it. The town I used to live in decided to put solar panels on every school in town. Not only would it defray the cost of electricity, but the mayor was adamant that it be used as part of science education. They started with the elementary schools and eventually added them to the new jr high that was built and to the high school that was retrofitted. All stop lights are solar driven and it isn’t just one or two stop lights. Every bit helps to ease the burden of real estate taxes. As you drive the highways and routes of MA, one can see solar and wind turbines popping up (some have been there going on a decade). We’ll get there eventually. Glad to see that some states are getting their act together and moving forward. SLM, I think every school with flat roofs should be covered with solar panels. Also municipal buildings and car ports and garages. There should be a panel where ever there is a street light as well. SLM, it is important to do whatever we can. Every array that goes up helps. You are so right, every little bit helps. Miles--the Germans were smart in a number of ways. The government ran surpluses in the 90s and rather than cut taxes, they used the money to run a test pilot program of solar panels along the length of the Autobahn. At the time, the panels were a loss leader, but the people in government knew that solar/renewable was going to come in handy some day. The Shell Oil International HQ is all solar PV glass.It’s also designed to take maximum advantage of what sunlight there is in The Netherlands by using baffles and mirrors to keep from flipping on electric lights during the day. Europe has always had to be smarter about energy use. The problem the US has is that we’ve always had all this ‘cheap oil’ around and never had to make plan B’s. Pleeeeze send urls for an article that describes and shows the building, ok? I want to put the pic up in the computer room. Thanks in advance! MBX, what you say is so true. To me it is common sense (uncommon among GOTP). I have called for solar panels along the Interstate roads right where the fence is to keep animals from getting hit. They could tie into the grid wherever the power lines cross over. There should be arrays on every government building, as well. Even a panel on each telephone pole. Nirek, I was trying to give an enthusiastic THUMBS-UP to your idea, but hit the wrong pic by mistake. Don’t know how to fix it, or I would. CG, no worries. Thanks for saying it was an accident. Miles, yes, Germany is way ahead of the rest of the world. Think though, if Germany can do so much with solar and they are further North than most other countries, then other countries have more potential. Vermont is pretty far North but not as far as Germany. That is why I decided to build my array. Germany is indeed a good example for others to follow. I find no reason to slight them. But reusing the waste land of old coal mines is why I point to the UK. 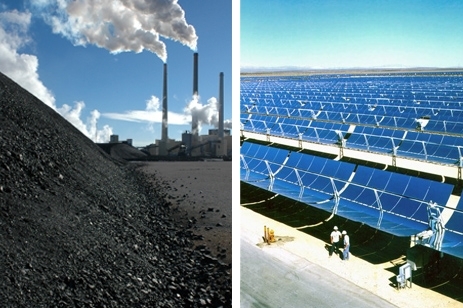 From coal to solar is a good thing. It is exciting to see some take our energy problem seriously. We need a revolution of ecological change all over this country but in the meantime smaller numbers are taking up the fight and that is good. Sue, as our mutual friend Kalima says every bit helps! My Dad used to say” Like the little old lady who peed in the ocean said, every little bit helps”. It is true though each person making a difference changing to led lights or putting a solar array up. It has an accumulating affect.